The State of Vermont is known for its excellent opportunities for outdoor recreation. There are many lakes and rivers that offer great boating opportunities to be enjoyed by residents and visitors alike. In the winter an entire network of trails appear for snowmobile enthusiasts. The Vermont State Police Marine/Snowmobile Enforcement Division is primarily responsible for ensuring the safety of the recreating public whether on our waterways or enjoying our many snowmobile trails. The Division is often called upon to support the State Police Scuba Team and the Search and Rescue Team. In addition to enforcing snowmobile and marine laws, the Division also offers many education programs designed to make the waterways and trails safer for everyone. This Division works closely with agencies such as the United States Coast Guard and the Vermont Association of Snow Travelers (VAST). The Vermont State Police Marine & Snowmobile divisions are staffed by members of the Vermont State Police Auxiliary. Auxiliary Troopers are part-time positions within the Vermont State Police. Many of the duties of the Marine/Snowmobile Enforcement Division are seasonal, and the positions are well suited to students and even teachers. Many current Troopers began their careers with the State Police as Auxiliary Troopers. 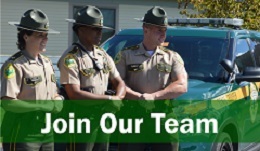 We are currently seeking qualified applicants for Auxiliary positions throughout Vermont. Please contact Sergeant Trevor Carbo at the address above for more information. Riding season is right around the corner. Please make sure you know Vermont laws when enjoying the out-of-doors on your off-road vehicle of choice.